It's 2015, and on average, women still make 78 cents to a man's dollar. A new report goes beyond that oft-quoted statistic, and examines this discrepancy along racial, geographical and educational lines. The American Association of University Women's (AAUW) "The Simple Truth about the Gender Pay Gap" report breaks down the wage gap in every state, including Washington D.C., using data from 2013. The U.S. capital comes closest to pay equity, with women earning an average of 91 percent of the wages that men do. 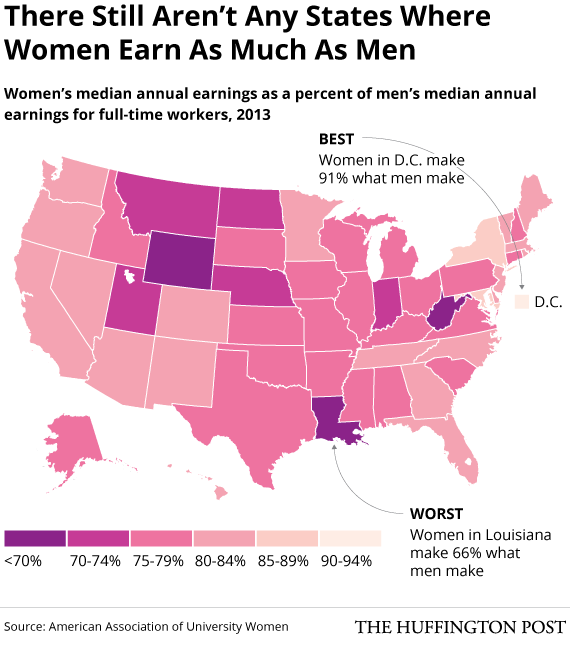 At the bottom of the list is Louisiana, where women earn just 66 percent of what men do. The report also found that women of color continue to be hit hardest by the gender wage gap. Asian-American women actually earn more on average than white women do, earning 90 percent of what white men make. Yet Hispanic women's salaries were just 54 percent and African-American women's salaries were just 64 percent of what white men earned in 2013. And these gaps exist even when "life choices" -- such as stepping out of the workforce temporarily to have children or choosing a particular major in college -- are accounted for. AAUW found that a 7 percent gender wage gap existed among college graduates one year out of school after controlling for "college major, occupation, economic sector, hours worked, months unemployed since graduation, GPA, type of undergraduate institution, institution selectivity, age, geographical region, and marital status." And 10 years after graduating college, that gap grows to 12 percent. It would be great if money didn't matter, but as we all know, it really, really does. And since women are often charged more for everyday items like razors and skin cream, the fact that we are paid less on average is even more infuriating. On Equal Pay Day, it's important to acknowledge where we're still falling short on gender equality and what we can do to make it better. Below is a state-by-state breakdown of where we're at right now. "We need to stop buying into the myth about gender equality. It isn’t a reality yet. Today, women make up half of the U.S. workforce, but the average working woman earns only 77 percent of what the average working man makes. But unless women and men both say this is unacceptable, things will not change. "Men have to demand that their wives, daughters, mothers, and sisters earn more—commensurate with their qualifications and not their gender. Equality will be achieved when men and women are granted equal pay and equal respect."